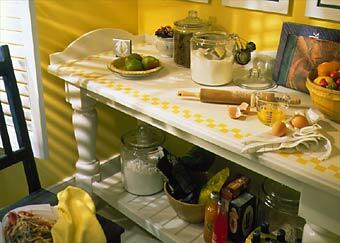 This baker's table made entirely of Corian® in Blizzard, with a checkered inlay in Sun, would brighten any kitchen. Creating a home that reflects your personal style can be a lot of fun. Whether you're remodeling or building a new home, discover how Corian® fits your style - and your lifestyle. The benefits of Corian® go beyond its beauty and expressiveness. Beyond its practicality and performance. It's just as appealing because of how it makes you feel. You'll want to run your hand across it over and over again because it's so warm and inviting, and it will be there for years to come because Corian® provides a look that lasts. 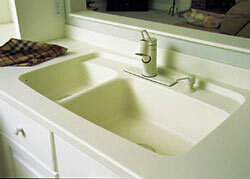 Click here for more information about Corian® Solid Surfaces.